Our expertise in the production of Chrome frameworks is extensive and we regularly supply to other dentists around the country. 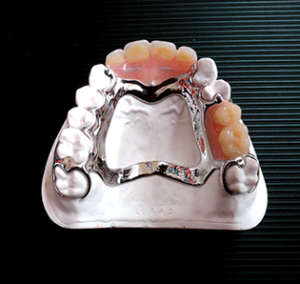 For partial denture wearers, a Chrome framework is often a more suitable option. This type of framework works by connecting onto and around existing teeth to hold the denture firmly in place, making them more secure and providing a fit which is healthier for soft tissue in the mouth. For those who struggle with the feeling of “bulky” dentures, Chrome based dentures can also be made ultra thin for a more light-weight feel.